The annual Defense Health Information Technology Symposium will begin tomorrow at the Caribe Royale Hotel and Convention Center, Orlando. The Defense Health Agency (DHA) is a joint integrated Combat Support Agency that enables the Army, Navy, and Air Force medical services to provide a medically ready force and ready medical force to Combatant Commands in both peacetime and wartime. The DHA supports the delivery of integrated, affordable, and high quality health services to Military Health System (MHS) beneficiaries and is responsible for driving greater integration of clinical and business processes across the MHS. Please stop by the NCS booth, #608, and talk with Joe Guest, Matt Cooke and Linda Letosky, who are experts on service IT needs. NCS is showcasing the the most efficient ways of operating and managing secure virtual networks, including servers and end points for VDI, Getac rugged PCs and servers, medical carts, and rugged cabinets. NCS has a broad portfolio of solutions to solve the many IT challenges that the DHA faces. NCS solutions all are focused on improving manageability, driving down cost of ownership and improving security. Today, Wednesday, is the final day for TechNet Fort Bragg Symposium & Expo! The event is organized by AFCEA, and is an important Army professional development forum, attacting members of U.S. Army Forces Command, U.S. Special Operations Command, U.S. Army Special Operations Command. U.S. Army Reserve, U.S. National Guard and Joint Special Operations Command. Traffic has been heavy at the booth. Staffers Joe Guest and Linda Letosky are finding a tremendous amount of interest in the Cirrus family of virtual zero client end point devices, Getac rugged PCs and servers, and the Defender E-Tools rugged cabinet. NCS zero client end points lead the industry in innovation, ease of use and low cost of ownership. 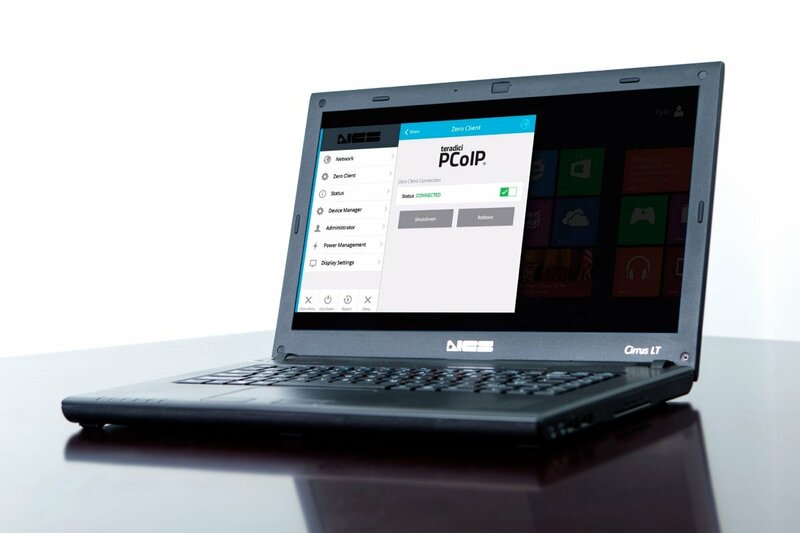 NCS solutions rely on the PCoIP protocol networking technology. PCoIP compresses, encrypts and encodes the entire computing experience at the data center. Information is transmitted as pixels across the IP network to the end points. Users have a high performance, fully functioning computing experience - even in HD. NCS uses the VMware virtual platform for our zero client end points. TechNet Fort Bragg Symposium & Expo starts today! The event is organized by AFCEA, and is an important Army professional development forum, attacting members of U.S. Army Forces Command, U.S. Special Operations Command, U.S. Army Special Operations Command. U.S. Army Reserve, U.S. National Guard and Joint Special Operations Command. The show runs today and tomorrow. Please stop by the NCS booth, #128, and talk with Joe Guest and Linda Letosky, who are experts on Army IT needs. NCS is showcasing the the most efficient ways of operating and managing secure virtual networks and end points and rugged IT resources. At Booth #128 visitors will see the Cirrus family of virtual zero client end point devices, Getac rugged PCs and servers, and the Defender E-Tools rugged cabinet. TechNet Fort Bragg Symposium & Expo, organized by AFCEA, is an important Army professional development forum, attacting members of U.S. Army Forces Command, U.S. Special Operations Command, U.S. Army Special Operations Command. U.S. Army Reserve, U.S. National Guard and Joint Special Operations Command. Members of the military plus government civilian workers join the technology industry to explore the latest trends in cyber security, cloud services and virtualization. Key expo dates are April 25-26. Please stop by the NCS booth and talk with Joe Guest and Linda Letosky, who are experts on Army IT needs and the direction of the latest technologies. NCS is a long-term supplier of innovative computing solutions to the Army. At the Expo NCS is focusing on the challenges in obtaining, operating and managing secure virtual networks and end points and rugged IT resources. NCS solutions include the Cirrus family of virtual zero client end point devices, Getac rugged PCs and servers, and the Defender E-Tools rugged cabinet. The Washington area VMware User Group meeting yesterday was a highly productive interaction among VMware officials, VMware users and the vendor community. NCS attends most VMUG expos around the United States and highly values the interactive learning experience. VMware users are happy to explore new use cases and test virtualization solutions that address a variety of environments. On Wednesday the staff at the active NCS table meet with many in the mid Atlantic virtualization community, including government, education, system integrators, vendors and the financial community. At the NCS table we showcased the revolutionary NCS Cirrus LT and LT Plus virtualized notebook PCs, the Cirrus DT WiFi virtual desktop and the Cirrus TZ family of virtual desktops. NCS is also considered a world leader in its NCS-designed and developed zero client end points, which lead the industry in innovation, ease of use and low cost of ownership. On Wednesday the Washington area VMware User Group comes to town, drawing active VMware product users in the virtualization community from the District and surrounding tri-state area. Many in the community are actively implementing desktop virtualization, hybrid cloud and data center management programs. Nearly everyone is looking to learn more about improving security. Market segments that attend the education and networking event include those from banking and finance, education, healthcare and government. NCS is active at most VMUG events around the country and our table will be staffed all day at the Marriott Wardman Park Hotel. Our staff is delighted to discuss all aspects of virtualization with those stopping by Table #17. For example, NCS offers complete Hyper Converged Systems for the data center that integrate compute, software-defined storage and software defined intelligences. NCS partners with Hewlett Packard Enterprise to deliver solutions that combine intuitive software with the reliability of a world-class platform. NCS is also considered a world leader in its NCS-designed and developed zero client end points, which lead the industry in innovation, ease of use and low cost of ownership. Our end points rely on VMware software, the most trusted virtualization platform for desktop applications. Our end point solutions will be on display at Table #17. AUSA Expo, organized by the Association of the United States Army Institute of Land Warfare, is an important Army professional development event. More than 6,000 guests are attending and today marks Day Two of a three-day trade show. Please stop by the NCS booth and talk with Joe Guest and Mark Cuthie, who are experts on Army IT needs and ready to demonstrate a range of computing solutions that are tactical, fully deployable and often rugged. NCS is a long-term supplier of innovative computing solutions to the Army and is investing to take the relationship to the next level. 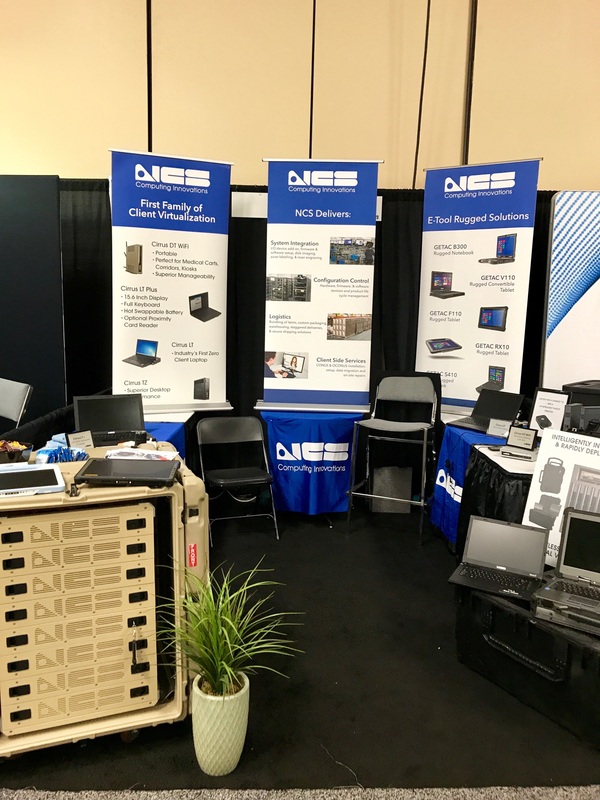 At AUSA NCS solutions include SecureView virtualized workstations and desktops, the Cirrus family of virtual zero client end point devices, Getac rugged PCs and servers, and the Defender E-Tools rugged cabinet. The Defender E-Tools Cabinet -fully rugged and fully deployable - is proving to be a big hit at the booth. Defender is built to offer cost effective, exceptional shipping protection of notebooks and tablets. The cabinet is designed around a proven Hardigg transit case with an integrated shock mounted rack system. NCS is also demonstrating a fully functioning and deployable VDI network based on our servers and the NCS zero client portfolio. AUSA Expo, organized by the Association of the United States Army Institute of Land Warfare, is an important Army professional development forum. More than 6,000 guests are attending the event through Wednesday. Along with NCS, more than 200 vendors are exhibiting. Please stop by the NCS booth and talk with Joe Guest and Mark Cuthie, who are experts on Army IT needs and the direction of the latest technologies. NCS is a long-term supplier of innovative computing solutions to the Army. At AUSA NCS is focusing on the challenges in obtaining, operating and managing secure virtual networks and end points and rugged IT resources. SecureView is a low-cost, multiple-independant-levels of security workstation-based technology which allows a single computer to host multiple guest VMs running at different classification levels. NCS is the leader in providing SecureView desktops to the government. AUSA Expo is organized by the Association of the United States Army Institute of Land Warfare, and is an important Army professional development forum. More than 6,000 guest will attend and more than 200 vendor exhibits will be on display. AUSA ILW Global Force Symposium & Expo, March 13-15, includes presentations from the United States Army Materiel Command, the United States Army Training and Doctrine Command, and the Office of the Assistant Secretary of the Army (Acquisition, Logistics and Technology). The symposium explores the capabilities outlined in the Army Operating Concept and how the force transforms from being adaptive to driving innovation for Force 2025 and beyond. Presentations coupled with panel discussions from senior military and industry leaders addresses critical points of acquisition, research and development and partnering between military and industry. NCS is a long-term supplier of innovative computing solutions to the U.S. Army. NCS will engage with senior military and government officials and IT administrators on the challenges in obtaining, operating and managing secure virtual networks and end points and rugged IT resources. NCS will showcase its comprehensive portfolio of computing solutions, including SecureView virtualized workstations and desktops, the Cirrus family of virtual zero client end point devices, Getac rugged PCs and servers, and the Defender E-Tools rugged cabinet.